In addition to being a prominent ship owner and whaling merchant, Alexander H. Cory also served as postmaster for Westport Point 1840 – 1897. Among the Cory Family Papers at the New Bedford Whaling Museum is a fascinating collection of letters sent from Westport to crew members aboard vessels from their friends and family, but which were never delivered. 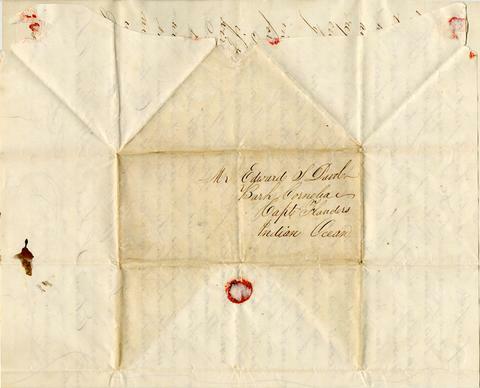 These dead letters offer a personal insight into the nature of communication between whalemen and their families. Filled with local gossip, the letters convey both good and bad news, with widely varying literacy levels. I improve this opportunity to inform you of my health which am berry good at present and hope these few lines will find you enjoying the same proper good blessin. Our folks are all well etc. George F. Davol sailed on the 5th of April last in the good Bark Marcella Capt Worth of New Bedford for the A Ocean. He came home in the right time when there was nothing for him to do. He hared round a while then he went to school at the head of the river about 6 weeks then he swore that he would go no more for he had got learning enough. He like his older brother on former voyages spent nearly all of his voyage before he sailed. And Father not having horseflesh enough for him he bought the bay mare that Fred Brownell used to have. She used to have to goit about every night. Sleighing him especially. So no more about your amorous brother. Perry G. Lawton has married Miss Hannah P. Brownell, and Ei P. Lawton waited on your June meeting gal. Look out or you will lose her sure as hell. We have received no letters from you since you was at the western islands. In your letter to George you requested him to acknowledge to Sallee Brownell. When he read it he said he should do no such thing and I suppose he has not. Now since he has saved you from impending ruin by writing an anonymous letter, instead of heaping reproaches and execrations on his head, you ought (in my opinion) render to him the greatest tribute of your gratitude and love. Perhaps you think me jesting but I am in earnest. You say you would not marry for skin now. What else is she good for. I should consider you as insane indeed if you were to marry a girl that was not virtuous and had lost her maidenhead. Now it can be proved to a demonstration that a certain chap in Westport did stay with Father the night before he sailed, and she having the flowers did paint the map of the world on his shirt-tail, and w hen he went a board he gave it to davy Jones. She has turned off her beau and some think that you will marry her yet. Should that take place and I live I should be under the disagreeable necessity of banishing myself from New England. I consider you as having stood on the verge of an awful precipice and crawled back just in time to save your neck, etc. I am engaged in farming this summer and have given up all ideas of whaling. The spring is very backward. It snowed on the first of this month, and we had ice on the 6th. Today we have a cold northeaster and it seems as if old winter’s frosty breath had come over our land and that we doomed to be an eternal winter. I expect to go back to Middleboro’ next July. George has got learning enough but I not being so lucky as he, have not. Charles H. Macomber came hoe the first part of spring. Please write at every opportunity. Now if I have wrote anything that will hurt your feelings rest assured it was unintentional. I was to show you your situation which you could not see (for love has no eyes) rather than hurt your feelings. I now take the third opportunity to inform you that our little number is well and hope that you are the same. Our mother and Caroline and Mary and George P. Dyer last fall with the disintery. It was very syckly a grate many dyed. John was vay sick but now is well and a coasting and Charles H. Macomber Charles is married to Sylvia George. Frank and Nancy is married and Philip Davol. Uncle Levy has gon out west. Warren Tripp ben to gale for stealing out of or in Churces store and was bailed out by Jerry Davol and Stepehn Kerby. Joseph Tripp has mooved to Fall River. It is very dull times in this place and others verry dull. I am sick a looking for work. I have given up whaling. I got home last December with 200 bbs. This entry was posted in Letters from Home, People, Westport Point, Whaling folks.